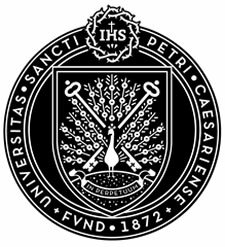 Saint Peter's University (formerly Saint Peter's College) is a private, coeducational Roman Catholic college in the United States. Located in Jersey City, New Jersey, it was founded in 1872 by the Society of Jesus. Today, Saint Peter's is one of 28 member institutions of the Association of Jesuit Colleges and Universities. Saint Peter's University offers over 33 majors to more than 3,200 undergraduate and 500 graduate students. Its college mascot is the Peacock (the women's sports teams are called the Peahens), and its sports teams play in the Metro Atlantic Athletic Conference, of which it is a founding member. The school is located on a 15 acre (61,000 m2) campus just south of Journal Square, and is 2 miles (3 km) west of New York City. Evening and weekend classes are offered in Jersey City, Englewood Cliffs, and South Amboy.